This year, I was hoping to climb as many of the handful of 4000-footers that I had only climbed once, and to climb them by a different route if possible. This trip would fulfill part of that goal. 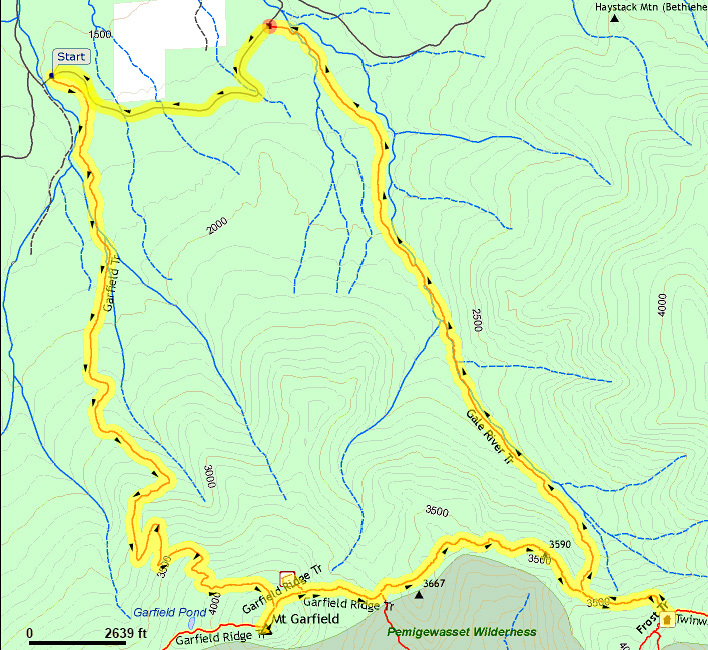 I had climbed Mt Garfield once, back in the fall of 2000, and although I had also ascended the Garfield Trail the last time, I had never been on the portion of the Garfield Ridge Trail between the Garfield Ridge Campsite and the Gale River Trail. Furthermore, by going down the Gale River Trail, it would be an easy hike back to my car on the Gale River Loop Rd. The trail began gently, angling almost imperceptibly upward through a mixed hardwood and hemlock forest. The tinkling and bubbling of nearby Burnt Brook resonated through the woods. The day was pleasant, the birds were singing, and spring was in the air. Hobblebush was in full bloom, as were those ubiquitous harbingers of spring, trout lilies, which particularly thrived amidst a large stand of white birches about halfway up the mountain. The birches, in an area that had burned in a forest fire around the turn of the century, were a light and airy oasis in an otherwise thicker and darker coniferous forest. 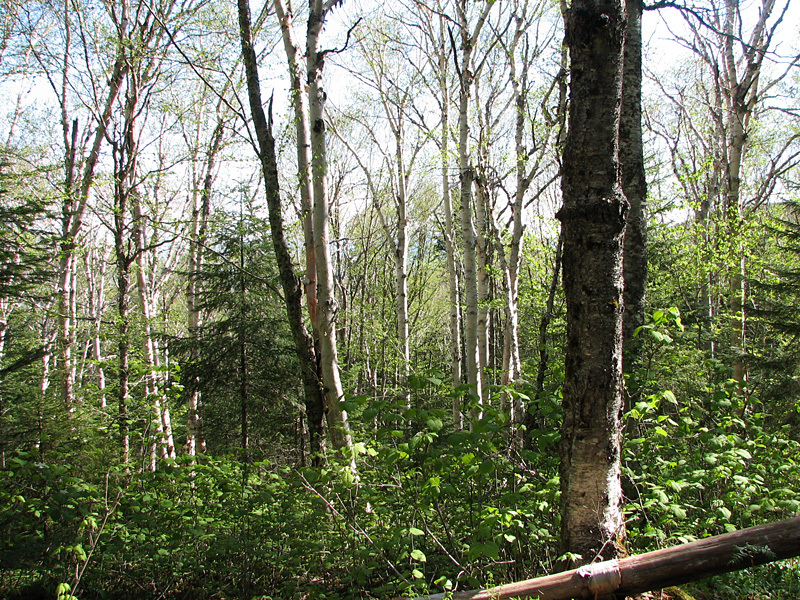 Above the birch stand, the trail continued to steepen, but its effect was moderated by numerous long switchbacks. Although somewhat almost 5 miles in length, time goes by quickly on this relatively gentle trail with excellent footing. 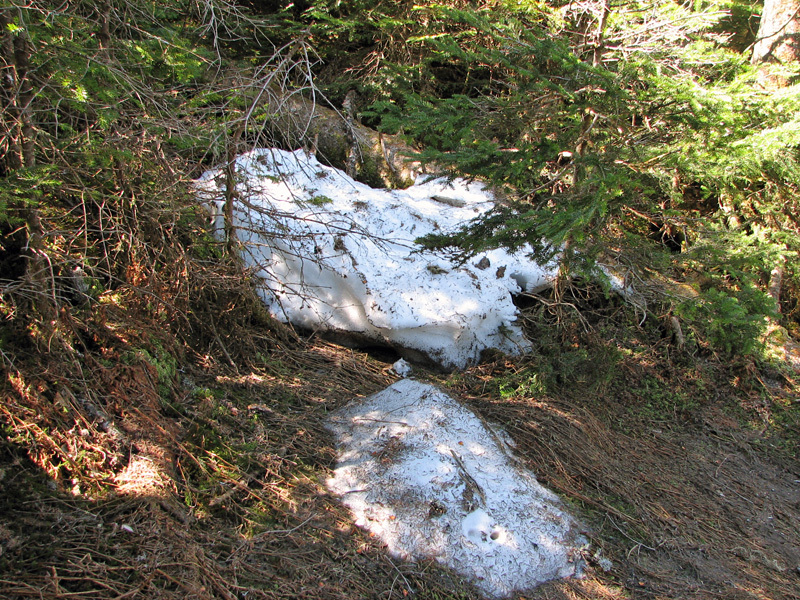 Above 4000 feet, I began to encounter small patches of decaying snow in the deep shade just off the trail. These last scattered remains of a long cold winter were few and far between. In less time than I had expected, I reached the junction with the Garfield Ridge Trail. The summit was close now. 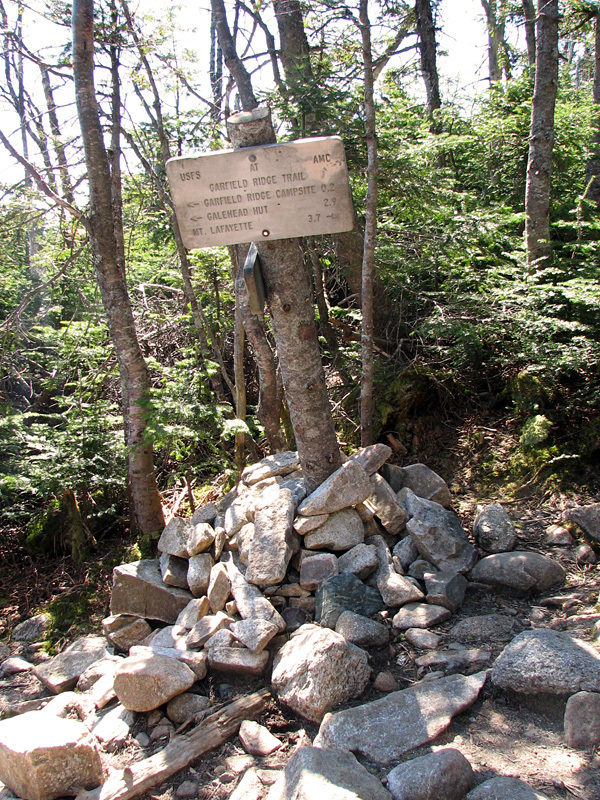 The trail sign, nailed to part of an old but stout yellow birch trunk, was anchored by a large pile of rocks, and leaned precariously to one side. The remainder of the climb ascended the steep and rocky Garfield Ridge Trail to a plateau just below the actual summit of Mt Garfield. 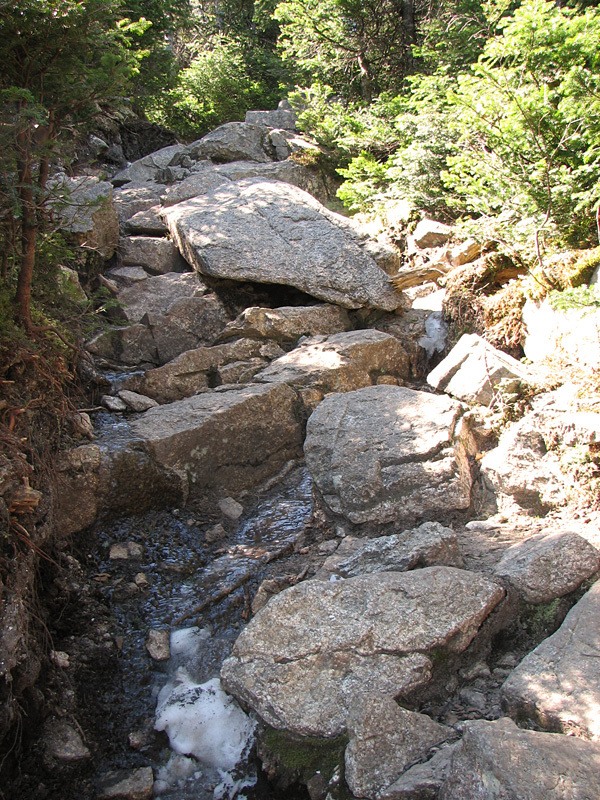 From there, it was just a short hop to the top on the Mt Garfield Spur. Garfield Trail. 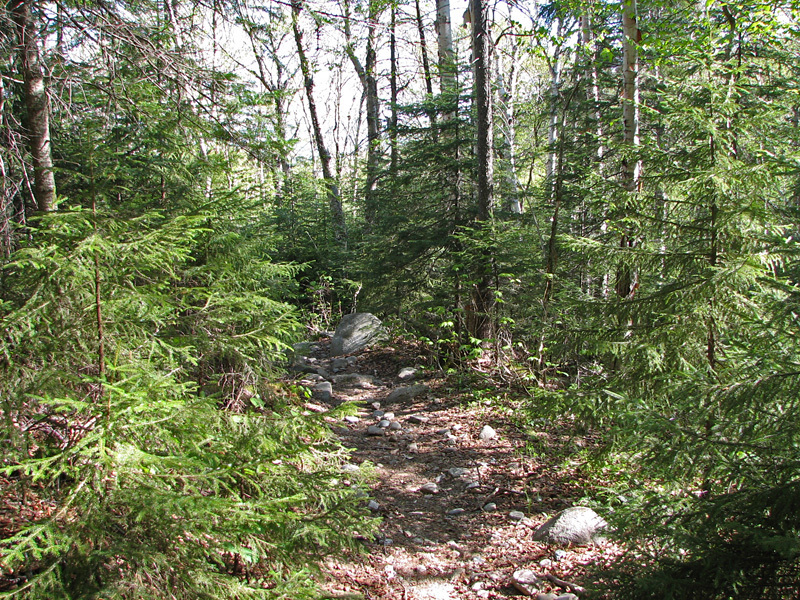 The trail is relatively gentle and has good footing most of the way. It switchbacks through the steeper parts up higher. Hobblebush. 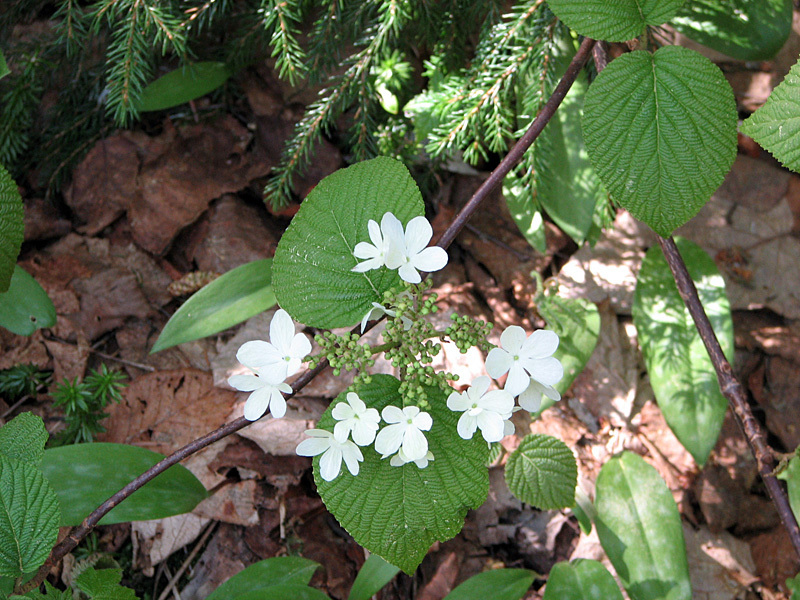 This shrub is plentiful at lower elevations, and grows well in the shade. Birches. This stand of white birches, in an area that had burned in a forest fire around the turn of the century, were a light and airy oasis in an otherwise thicker and darker coniferous forest. Trout lily. 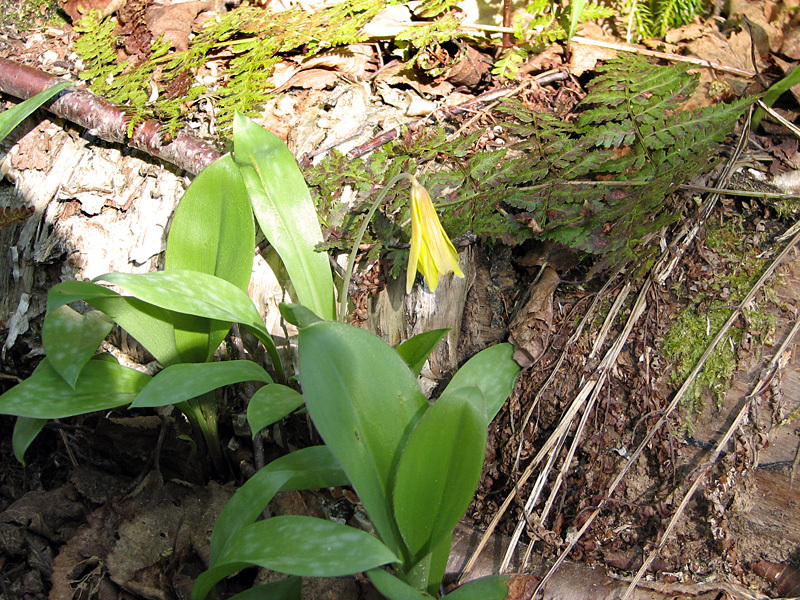 There were a number of these harbingers of spring growing along the trail in the birch stand. Patches of snow. These small snow patches were the last of only a few scattered remains of the winter. Garfield Ridge Trail sign. In less time than I had expected, I reached the junction with the Garfield Ridge Trail. The summit was close now. The steep climb to the summit. The Garfield Ridge Trail is steep and rocky from the Garfield Trail to the summit area, but it's only a couple of tenths of a mile long.